The final phase of the Holiday Inn Express Newport Beach guestroom and public space renovation was wrapped up this month, tallying yet another successful hotel project for the Level 3 Construction team. The growing demand of fitness amenities by today’s traveler can bare a challenge for properties to create space, but was achieved here through creative planning and collaboration with the city of Newport Beach. The final phase of the Holiday Inn Express Newport Beach guestroom and public space renovation was wrapped up this month, tallying yet another successful hotel project for the Level 3 Construction team. Designed by SANDdesign of El Segundo, Ca, the property now presents a refreshed SoCal harbor-themed look and feel that showcases its location on the historic Mariner’s Mile. 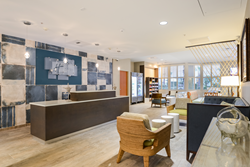 Managed by DKN Hotels, the 87-guestroom Holiday Inn Express Newport Beach now offers a complete new redesigned lobby, public space, breakfast area, expanded fitness center and modernized guestrooms. The public space portion of the project began with the complete demolition of the existing lobby, back offices, breakfast room and meeting space. The reconfigured floor plan maximizes the usage of the space and creates an open and welcoming communal setting for guests to enjoy. Renovated public restrooms, modern lounge areas, breakfast buffet and sundries were all strategically redesigned to flow with the lobby’s stylish new look. The relocation of the properties boiler room system from the first floor to the second floor allowed for the fitness center to double in size to accommodate new equipment. The growing demand of fitness amenities by today’s traveler can bare a challenge for properties to create space, but was achieved here through creative planning and collaboration with the city of Newport Beach. Founded in 2006 by President and CEO Ian Mahon, Level 3 Construction, located in Carlsbad, is one of California’s leading hotel renovation contractors with a growing presence in multifamily, restaurants, office and T.I.’s. Our project experience ranges from commercial remodeling and tenant improvements to multi-million dollar ground up construction projects and renovations. Level 3 collaborates with developers, owners, architects and property owners to implement the most efficient and cost-effective solutions that will reinvigorate a property. Level 3 Construction continues to grow its portfolio of work through quality performance and on-time completion of projects. To learn more about Level 3 Construction’s services, contact John Gonzalez at jgonzalez(at)level3construction(dot)com.